This article will introduce partition software with which you can resize hard disk without repartitioning when windows Server 2012 has low disk space on system partition. Download IM-Magic Partition Resizer Server to increase the size of system partition in Windows Server 2012 without repartitioning disk. Low disk space problem on system partition can cause lots of trouble to your computer, so it is necessary to fix the problem. Third-party partition software is helpful with partition resizing without repartitioning the hard disk. IM-Magic Partition Resizer Server is specialized partition software, which can not only work on Windows Server 2012, but also on other Windows Servers to increase the size of system partition to fix the low disk space problem. This partition software enables you to move free space from other partition on the same hard is disk to the system partition when it is running on low disk space. "I met a problem on my Windows Server 2012 PC, which reports low disk space warning message on system partition. There is only about 123MB free space left on the system partition. In addition to system partition, there are two other partitions (D drive and E drive) on the same hard disk. However, only E drive still has some free space. I want to open Disk Management to reallocate the disk space, but I don’t know how to do it. Can somebody tell me how to move the free space from E drive to system partition (C drive) without deleting any partition or data?" Hi! I need to some help to fix the low disk space problem on Windows Server 2012 system partition. Recently, system often reports the low disk space alert on the system partition. But I don’t want to add a new hard disk because there is much free space on this disk. The problem is that I want to move some free space from other partitions to the system partition. Therefore, can anybody tell me how to fix system partition low disk space by moving free space from other partitions on the same hard disk? 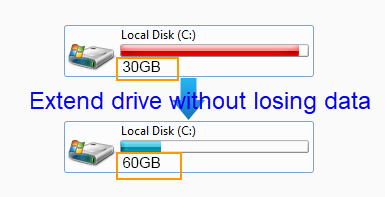 You can install more than one partition on a computer, but you cannot move free space from this hard disk to another one. Therefore, you can only move free space from the partitions on the same hard disk. If you want to move free space from other partition to the system partition, adjacent unallocated space is needed. 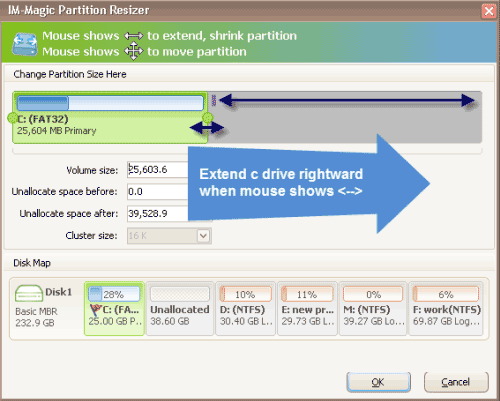 IM-Magic Partition Resizer Server enables you to shrink partition to create some unallocated space, and allows you to move the unallocated space close to system partition only with a few mouse clicks and drags. Therefore, this partition software can work perfectly to help resize hard disk and reallocate disk space when system partition is running out of disk space on Windows Server 2012. Usually, IM-Magic Partition Resizer Server is available for partition resizing when you run into any of situation above. This partition software is safe to resize hard disk without touching any data on the disk. * You can resize C drive on Windows Server 2003/2008, SBS 2003/2008, and Windows Server R2.